The company has entrenched its position as one of the renowned Wholesale Suppliers and Exporters of Two Wheeler Cables (Suprajit Cables). We offer exclusive range of Two Wheeler Cables such as Speedo Cables, Speedo Inners, Throttle Cables, Clutch Cables, Gear Cables, Rear Brake Cables, Front Brake Cables, Seat Lock Cables and many more for all segments of two wheelers which are OEMs. 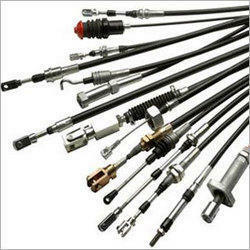 Our clients can place bulk orders of Two Wheeler Cables as per their demand and specifications. Rajdeep Traders was established in the year 1977 in Chennai (Tamil Nadu, India). We feels pride in introducing itself as a leading Wholesaler, Trader & Distributor of Automobile Products, having widest range of Two Wheeler Spares and Accessories. We are one of the well-known Wholesale Suppliers and Exporters of Automobile Products. Two Wheeler Body Parts, supplied and exported by us, are made from the best available raw materials and strictly as per OEM specifications. All our products undergo strict and thorough quality control checks by competent persons before introducing to the market. The brands marked are OEM’s based in our list have been arranged from OEM’s Suppliers. We are representing brands which are included in OEM’s. We supply and export Two Wheeler Body Parts for reputed brands such as Bajaj, TVS Motor, Suzuki, Hero, Honda, Yamaha, Royal Enfield, etc. The company was founded by Mr. Nagraj Jain, a well-known name in automobile market. His sons, Mr. Rakesh Jain and Mr. Mukesh Jain, expanded the range of products and their network throughout India and abroad. The Two Wheeler Body Parts, offered by the company, are available for almost all scooters & motorcycles parts running on Indian road. It has been our endeavour to supply our quality products at the most reasonable prices to enable our dealers to compete both in quality as well as prices. Quality upgradation and new product development being a continuous process at our company, we are committed to give what market demands. Owing to the skillful execution and quality management system, the company is touching new scale of heights. The high growth of the company is evident from the following chart of growth.